This site offers a home for all owners and sailors of the Swift 18 to swap advice and ideas, as well as post pictures and files relating to the lovable swift. We have many plans for the future, all depending on how this group grows, but the main objective is for everyone to get the best out of their Swifts and enjoy sharing experiences good bad and scary! 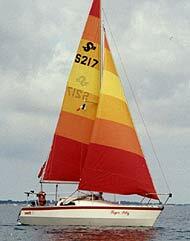 The Swift 18 first appeared at the 1981 Southampton Boat show and was designed as a fast yet comfortable trailer sailor conforming with the French Micro Cupper rules. The boat is virtually unsinkable with enough built in buoyancy to float if swamped, even with 3 crew aboard. The first Swift (either a prototype or number 1) was an aluminium boat made from sheet aluminium - hence the chine hull. The original intention was that all boats should be aluminium but this proved impractical and this boat was then used to make the moulds. The original manufacturer was 'John Charnley Associates' (JCA) who built boats from 1982 to 1985. These were the 1 to 218 series and at the end of this period they were built at Shamrock Quay in Southampton by a company trading under the name of "Swiftcraft" (still John's company). These boats all had tapered masts. In October 1985, John and his wife Caroline sold the business to a businessman who wanted to give the business to his son in order to entice him back from Australia. This did not work and eventually the business was bought by Honnor Marine at Totnes Devon. They built the 300 series of boats - different toerails, non-tapered mast etc - a bit of a cost reduced version. Honnor Marine started, on taking the production and ownership over from Swiftcraft, with natural aluminium toerails, then evidently bought a job-lot of black toerail, finally then produced a new top mould with a moulded-in toerai. Honnor Marine built about 35 to 40 boats. Roger Marsh who originally bought a Swift, was taken with the boat and for some time was a member of the association. He had an interest in Marine matters and owned "Marlin International". Eventually (around 1988 or so) Roger bought the rights, moulds and materials from Honnor Marine and began to market the 400 series of boats back in Southampton. He reversed some of the cost reductions which Honnor Marine had made but continued with the moulded-in toerail. The 400-Series boats reverted to the original as-designed weight of hull layup rather than Honnor Marine's heavier hulls and went back to a tapered mast. Only a small number of the 400 series boats were built. All were white with two-tone blue trim divided by a white band, 'Swift 18' or 'Swift 20' marked prominently and a smaller white '400-series' superimposed on the trim aft. At some point Roger discussed destroying the moulds, as he could no longer store them anywhere. The moulds then reappeared in Norfolk in 2005 and were bought by Mike Cooper who then built his own 500 series boat. The boat has 2 full-length single berths aft with a large double forward, a sink, 2 burner cooker and room for a loo. With 4' 4" head room in the cabin the accommodation is surprisingly comfortable. It also comes complete with a lifting keel which leaves only 3 inches exposed when raised making the boat easy to launch and retrieve from the trailer. With a little ingenuity the mast can be raised and lowered single handed. Reports at the time of the Swifts introduction considered her to have excellent and vice free sailing qualities, in a nasty Force 6/7 and with 2 reefs in the main she stayed light on the helm, was well balanced and galloped along like a racehorse (BPO April 82).